Tab dividers offer gold-stamped lettering accents on both sides of red leather tabs. Dividers are three-hole punched and reinforced for standard ring binders. Clear, single-side, reinforced binding edge prevents pullout at binder holes. Numerical tabs range from 1 to 31. 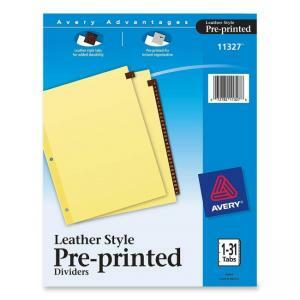 Dividers are made with quality buff paper.